The Greyhound Bus service is one of the most popular ways to travel along the East Coast of Australia – transporting thousands of backpackers between Sydney and Cairns each year and helping them enjoy everything this slice of Australia has to offer. But where does the Greyhound stop and what makes it one of the best ways to travel around Australia? One of the key advantages of the Greyhound Bus Passes is the fact they’re super flexible and as you’ll see from the Greyhound Route map it covers all the major destinations. Both the Hop On, Hop Off Passes and the KM passes allow you to jump on and off as you please en route. For those who have a set itinerary that’s ideal – you can pre book everything before you even land in Australia! But for those who love to go with the flow it means you can be spontaneous, extending your stay when you want and jumping off wherever you please! The Hop On Hop Off Passes do have a no backtracking clause though which means you have to continue in your previous direct of travel (North or South), however the KM Passes are limited by distance, so you can zig zag up and down as much as you want! Most importantly though for those planning their trip is where does the Greyhound stop up the East Coast? 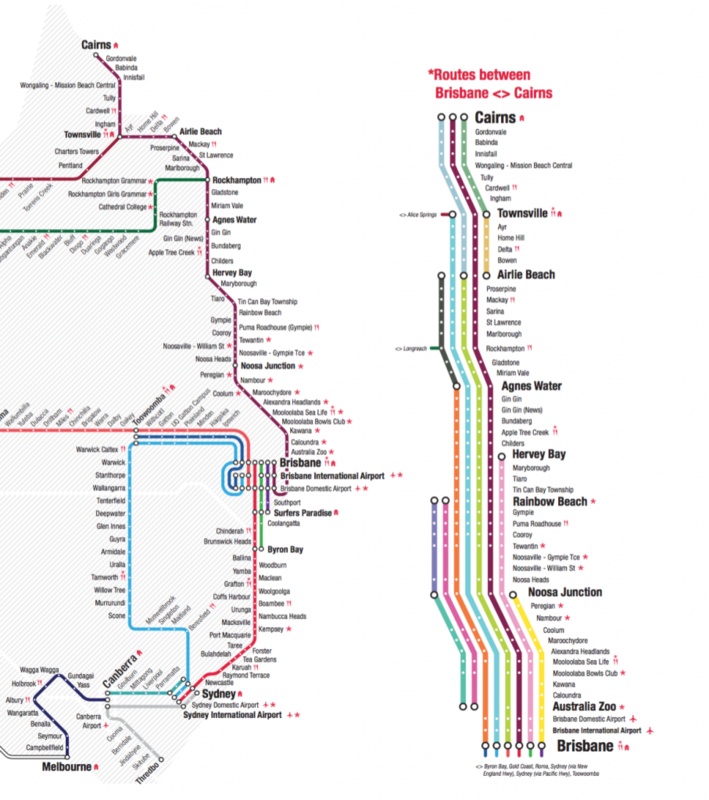 Well here’s the full Greyhound route map covering Melbourne to Cairns! As you can see it hits up heaps of places all along the coast including all the major spots like Byron Bay, Noosa, Rainbow Beach (for Fraser Island), Airlie Beach (for The Whitsundays), Townsville (for Magnetic Island) and Mission Beach – so you wont be missing out. Basically the Greyhound Bus Passes offer a great balance of flexibility but without breaking the budget. At $435AUD for the Sydney to Cairns Pass (approx £270) or $535 for Melbourne to Cairns (approx £335) it’s well worth the money to cover over 2,700km and with either 3 or 6 months (it’s $30 to upgrade to 6 months) to complete your route it’s more than enough for most backpackers in Australia. Sure the Premier Bus Passes are a bit cheaper at $320AUD (approx £200) for Sydney to Cairns, but they offer less daily departures and lack some of the comforts of Greyhound – like on board wifi, central drop off points (especially in Agnes Water/1770) and charging ports! It doesn’t sound like much but on a 13 hour overnight trip it does make everything a little easier! Although there are some other awesome ways to travel the East Coast (read my run down of them all here) The Greyhound is still the first one I always recommend! It’s also the perfect way to link together all the spots in my How To Spend 1 Month In Australia Sample Itinerary! Have you travelled on the Greyhound Bus in Australia?